As those of you who are in the KC area know (and perhaps the rest of you know as well? ), Thursday night very strong storms blew through the area between 1 and 2 am. Here in Independence, we had 82 mile per hour winds blow through ahead of what they are calling a bow echo. At about 2 am, Steve and I woke up to the loudest, scariest winds I have ever heard. The walls and the windows were shaking. I turned the TV in the bedroom on, saw a huge line of red on the radar, and said "Steve I think we need to go to the basement". My job - to grab the cat. Steve's job - find the flashlight (the power had at some time during these few instances gone out) and take our basket of important stuff into the basement. * Lily, our cat, of course ran away as I tried to grab her. 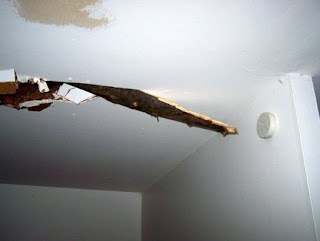 As I was looking to see where she went, I heard a noise I can't even describe - a crack and a thud all at once. Then a split second later - a more solid thud and crash. Then I hear Steve say - "The tree is in the living room". I look in to see a scene much like this (it was much wetter then, and darker, though Steve had found the flashlights and lantern). After that, thing were a blur for a few minutes. The winds had died down, so we did not feel in danger any longer. They lasted about as long as the microburst did in Lawrence a few years back. But in the next few minutes, I found Lily hiding under the bed, we moved the CD's that were directly under the hole, I put towels down to mop up the water (ha - that was useful), and called the landlords. We then began moving the rest of the DVD's and CD's, the TV, the TV stand, and one small bookcase (and the books in it). Somehow we did all of this in about 45 minutes in the dark. Adrenaline rushes are amazing. Oh - and I also found old pots and things to catch drip of water in. Our landlords came over about 3:30 that morning, bringing more lanterns, tarps, and buckets. They were amazing, and I feel lucky to be renting from them. In fact, our luck in this incident was amazing. 1. 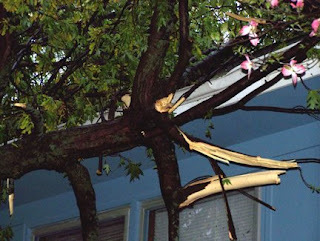 If the branch had hit almost anywhere else in the house, we would have had damaged furniture, books, yarn, etc. As it was, only a few of our DVD's and CD's that have cardboard cases have water spots on them. 2. 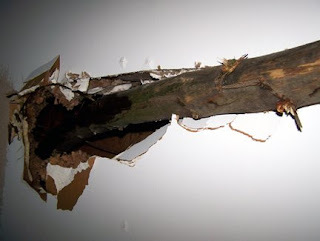 If the branch had hit our bedroom, we could have been hurt. 3. If the branch had blown towards our house a few more inches, the windows would have been busted. 4. Our landlords already have the holes patched and the debris cleaned up. The insurance adjuster is coming out Wed. to have a look. 5. We did not suffer the type of damage they had in Gladstone or North KC - there roofs were blown off, or in some cases, the whole house was blown off of its foundation. So all in all, we lost a night of sleep. And we are both grateful that was all. Here are some additional photos. The tree was a Silver Maple. I will never have one close to my house, they are notorious for breaking in high winds. In fact, the majority of the branches down in our neighborhood were from Silver Maples. 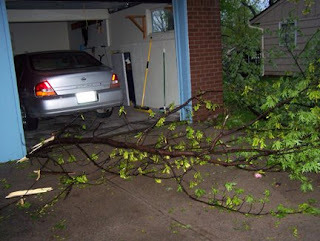 We were also lucky that the car was put in the garage (though we knew it was supposed to storm). If not, the car would have been smashed. * A 9 pm that evening, the tornado sirens had gone off. Since we were not in immediate danger from that storm (the sited tornado was well to our south, but still in our county), I took to time to grab some important items in a laundry basket: my purse, the digital camera, some of what I thought were Steve's rare CD's, and my recently completed handspun yarn.